Essential. Office bargain hunters prick up their ears when Nvidia's Optimus is offered along with a graphics card for 399 euros. 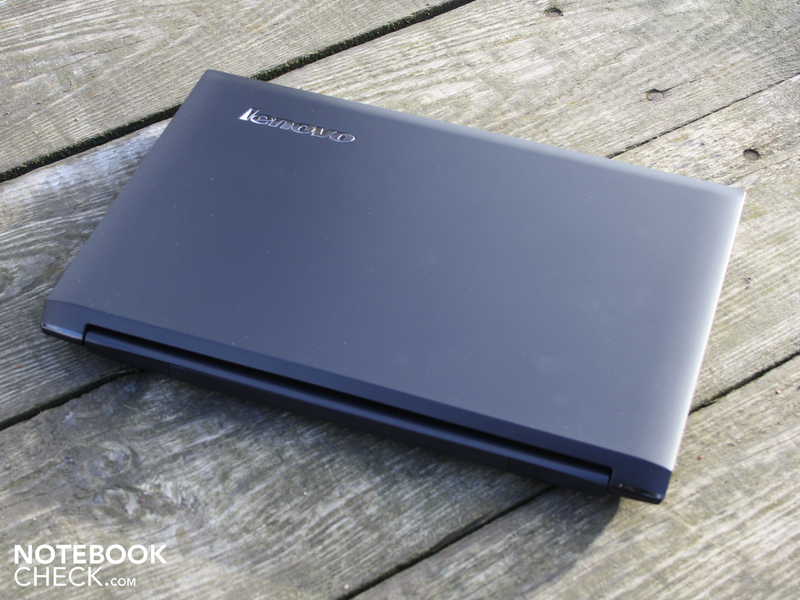 This is also the reason for our review of Lenovo's Essential B series. Performance for money champion or snail-paced runner? Lenovo IBM B560 (M488TGE): Will an aggressive price design and Nvidia Optimus meet up to business clients' requirements? 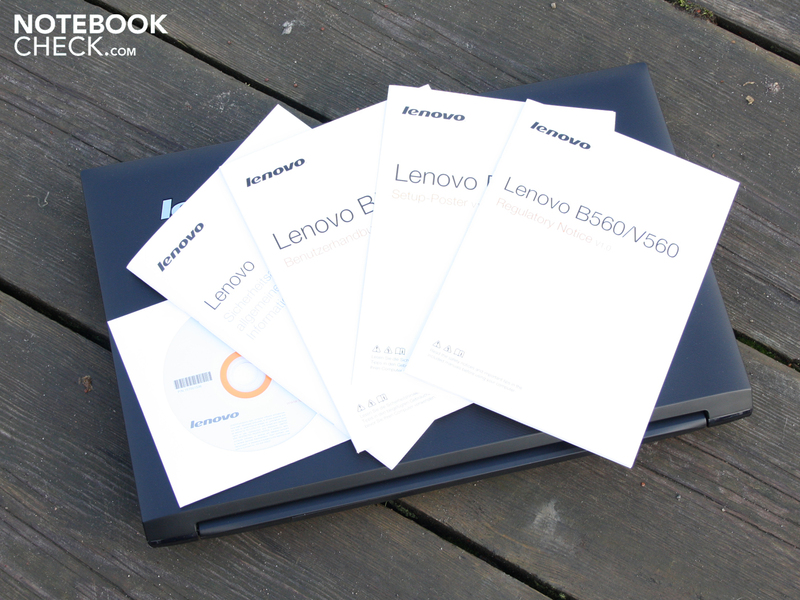 Lenovo IBM – laptops for pros? 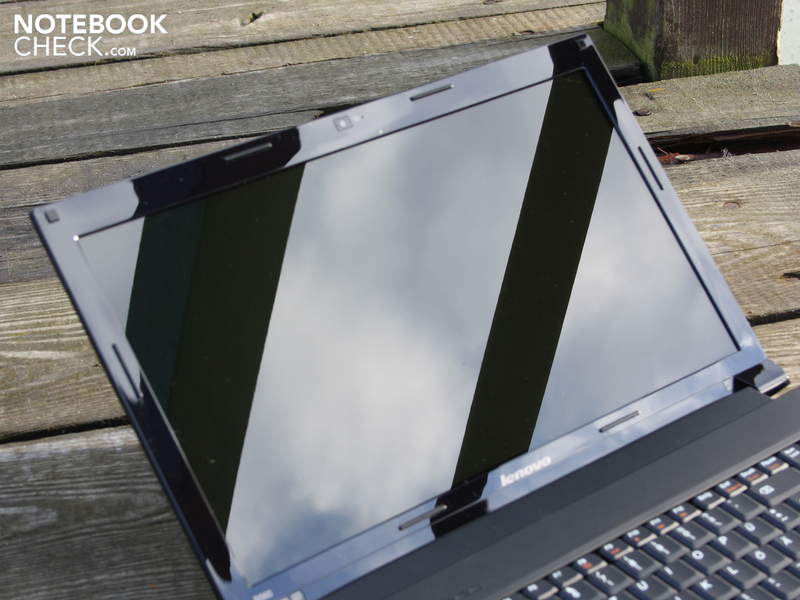 Lenovo sells its top and midrange notebooks with the branding Thinkpad. In the meantime, consumers are served with IdeaPads. But where can the business clients find an inexpensive device? Lenovo has pulled out its B range for this. 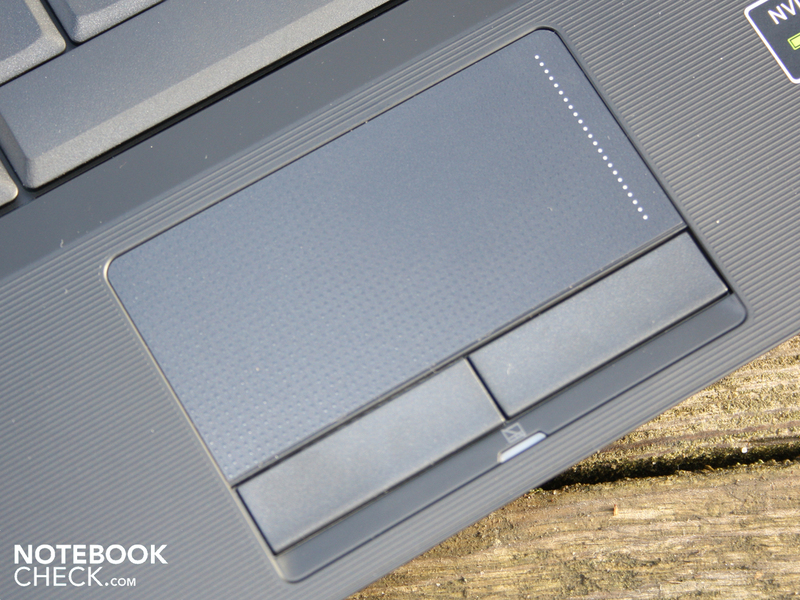 The simple laptops are remote from the Thinkpad array in both looks and technology. The 15.6 inchers are nevertheless to supply a solid all-inclusive bundle. The Essential B range serves everyone who wants to buy a loyal office companion for little money, and which doesn't have to be a jack of all trades by any means. So, is it actually a dull, antiquated technology with outdated features? Not quite, since Lenovo's B560 includes an almost still cutting edge Arrandale-Pentium with incorporated graphics and Nvidia Optimus at a bargain price. The dedicated Geforce 310M is disabled via the famous graphics switcher when it's not needed. 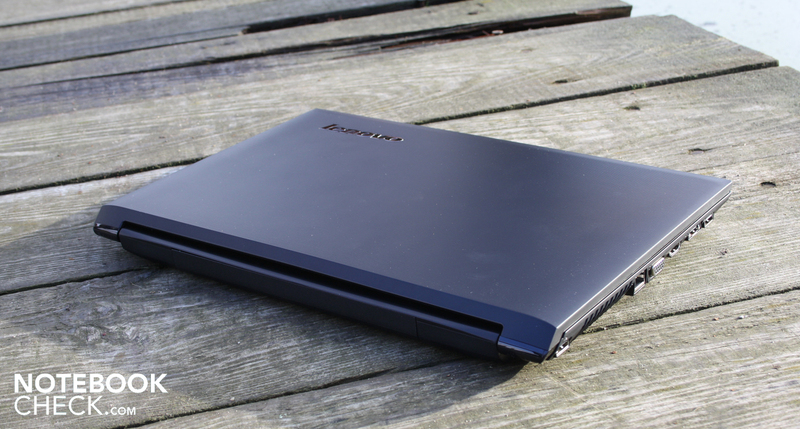 Is the Lenovo B560 the office solution for the price conscious multimedia fan in the office? How long does its battery last? And where has the manufacturer made cutbacks to achieve this low price? All answers to these and other questions in our detailed review. The foreboding plastic look of a cheap notebook fortunately doesn't prove true. Lenovo accomplishes creating a combination appropriate for work by fusing glossy (TFT bezel only), smooth (above the keys, base plate) and non-slip surfaces (lid, keyboard vicinity). The haptical grip and resistant, ribbed surface of lid and work area even leaves a certain impression of quality. Pragmatic users will place more focus on scratch and sweat resistance. The latest trend of pressing together plastics with haptical surfaces pays off for the users of the B560. The manufacturer's submerged chrome logo is the only noteworthy optical highlight because trendy aluminum applications aren't used. This however isn't a reason for complaint because the B560 has the fitting, unobtrusive look of a work device. Nothing will distract attention from Excel or Word. The base unit stands out with a good pressure resistance and torsional stiffness. In particular, the wrist-rest proves to be beyond doubt. Rare: the optical drive is for once no weak spot. The base plate over it can only be depressed with considerable force. Tightly pulled hinges keep the lid firmly in position. Nevertheless, it is inclined to teeter. The maximum opening angle is about 140 degrees and sufficient for use on the lap. We only need one hand for opening. There is no closing latch. The user thus has to make sure that no pen or small items can slip in between the case and lid during transportation without a cover. This can quickly become destructive for the screen. Even a bit of upgrade potential has been given. A cover on the bottom leads to the hard disk (2.5 inch, WD5000BEVT), the RAM slots (2x2048MB), the mini PCIe WLAN card (half size), an empty mini PCIe bay (full size) and the CMOS battery. 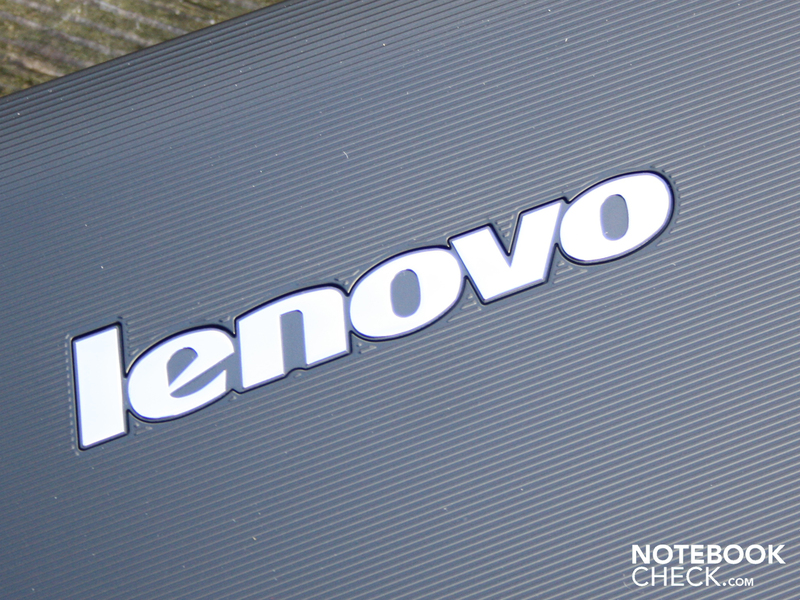 The Lenovo exceeds the minimum standard of office laptops in two aspects. There isn't a USB 3.0 for external hard disks. In return, it has an eSATA/USB combination. State of the art interfaces, such as USB 3.0, can't be refurbished due to the lack of an ExpressCard54, respectively 34, slot though. The second detail is the unoccupied mini PCIe bay (full size). This option is however only an issue for technically experienced users because the BIOS has to explicitly support every single expansion card that is inserted. There is a vast amount of SSD memories on the market (PCIe mini cards) for the mini PCIe slot. The B560 unfortunately bids an unfavorable port positioning for desk users. USB, eSATA, VGA and HDMI are found in the far front. This takes up a lot of room on the desk. It would have been best to lead the cables over the rear. 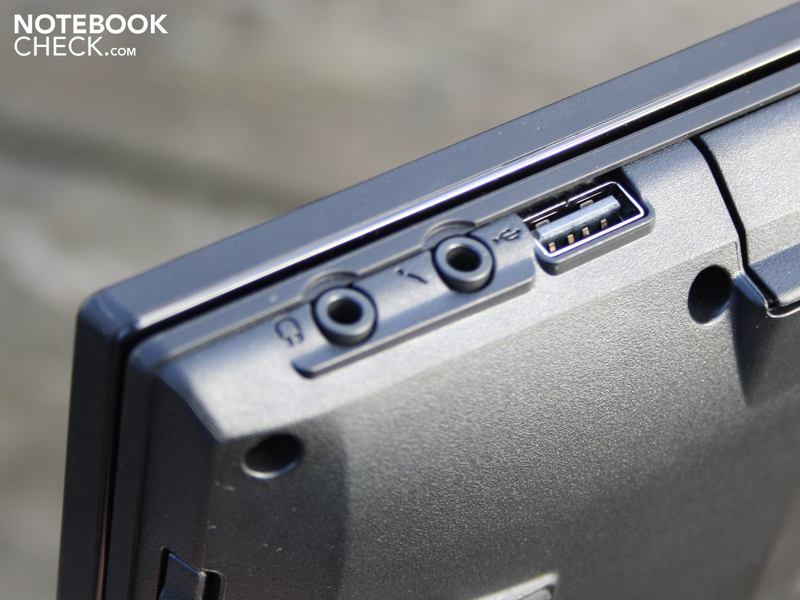 But this isn't possible due to the battery compartment's and hinge's design. 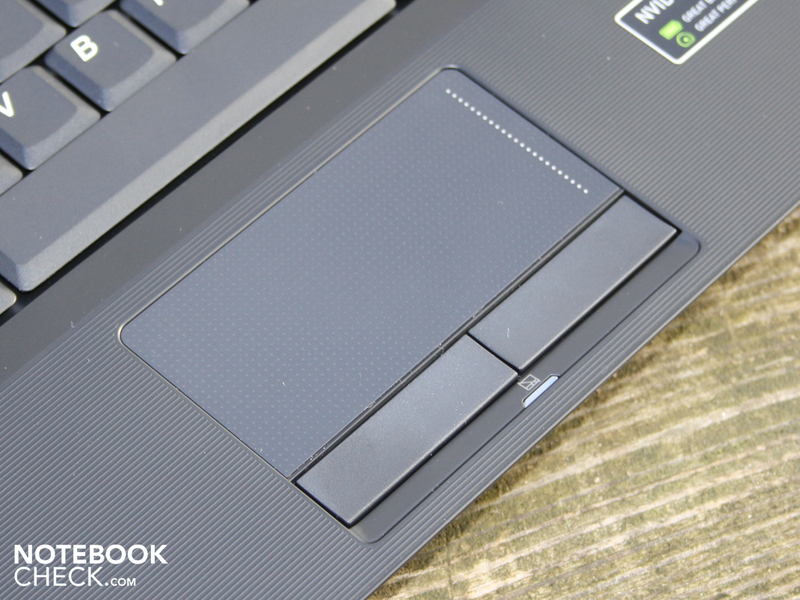 There is no docking solution for the Lenovo B range. The Broadcom 802.11n wireless adapter supports draft-n WLAN standard. A Bluetooth module has been omitted, likely because of the price issue. The Atheros AR8131 Gigabit Ethernet controller is state of the art. The user can't communicate any faster with the gigabit switch. The user calls up the manufacturer's recovery solution with the OneKey Rescue button on the turned on or off device. Recovery DVDs can be burnt or the system can be recovered with it. Theoretically, it's also possible to create a system recovery via image file. This wasn't possible in our case due to our test system's FreeDOS version. We installed Windows 7 64bit from our own DVDs. USB Port Locker allows the USB ports to be locked so that only password protected data can be copied from the computer. This is a feature passed on from Thinkpads. Requisite is the installation of Lenovo's Security Suite, which wasn't included in our FreeDOS device. This tool also makes it possible to store encrypted data on a hidden, virtual hard disk (YoSafe). The well-known Security Suite (anti-virus, Firewall, spyware) is Lenovo's solution for small and one-man businesses without IT expertise. 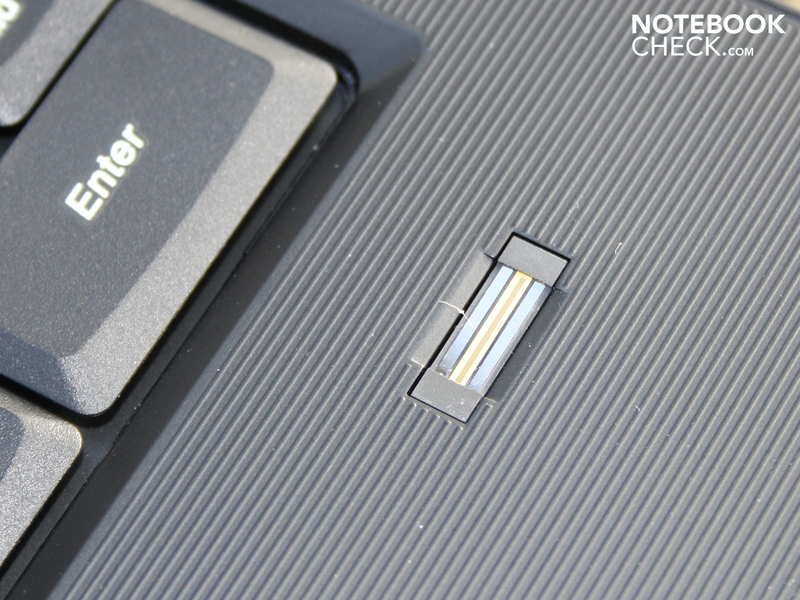 The user can always log in quickly and easily with the fingerprint reader (Lenovo BioExpress). Having to reenter your password can get annoying when you're logged out after a few minutes of idle due to security reasons at your workplace. Our B560 is delivered without an operating system due to the aggressive price of 399 euros. We installed our own Windows 7 64 bit. 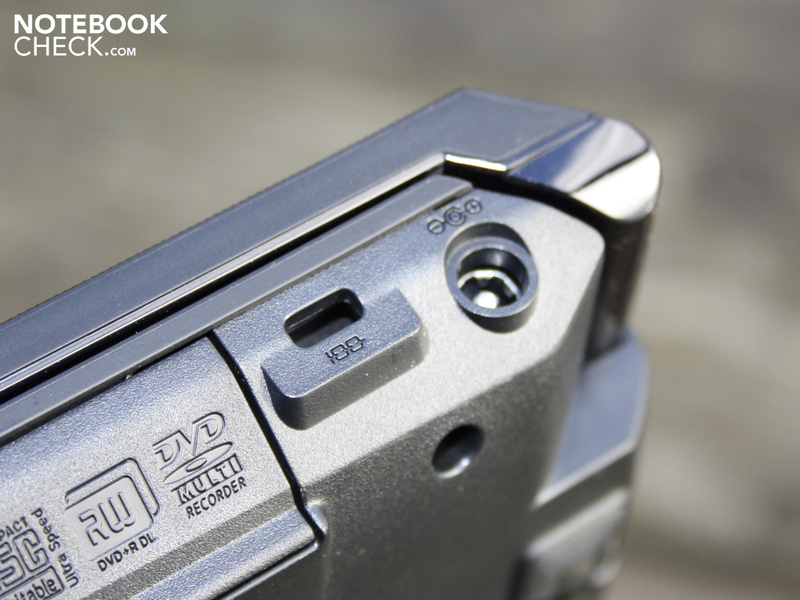 We were able to set up the notebook step by step with the included driver CD (32 & 64 bit) without complications. The B range's manufacturer warranty only covers a 12 month period. The device has to be sent in at your own expense. The price doesn't play a role for the warranty period. 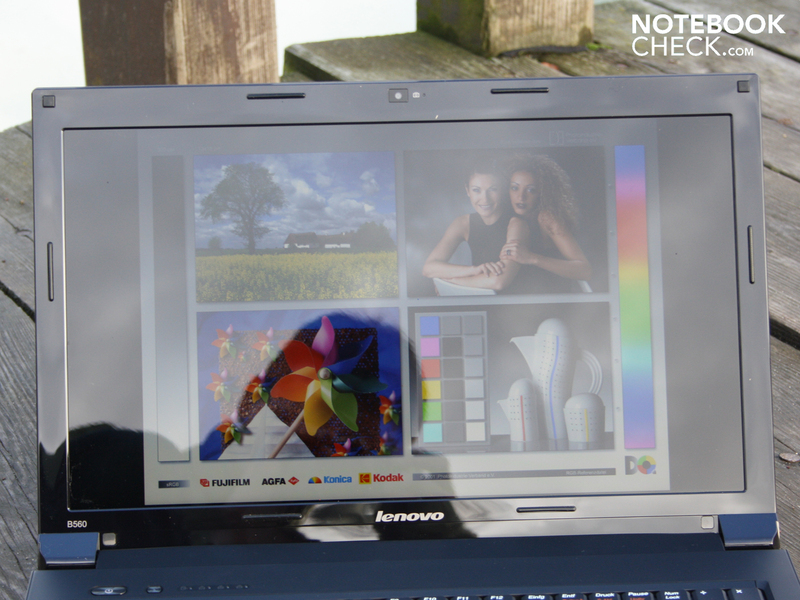 The aforementioned 12 months is also granted for your B560 with Core i5-640M and Windows (599 euros). A warranty extension to 3 years (bring in) costs 70 euros for the B560/U350/U450p/U550/Y. 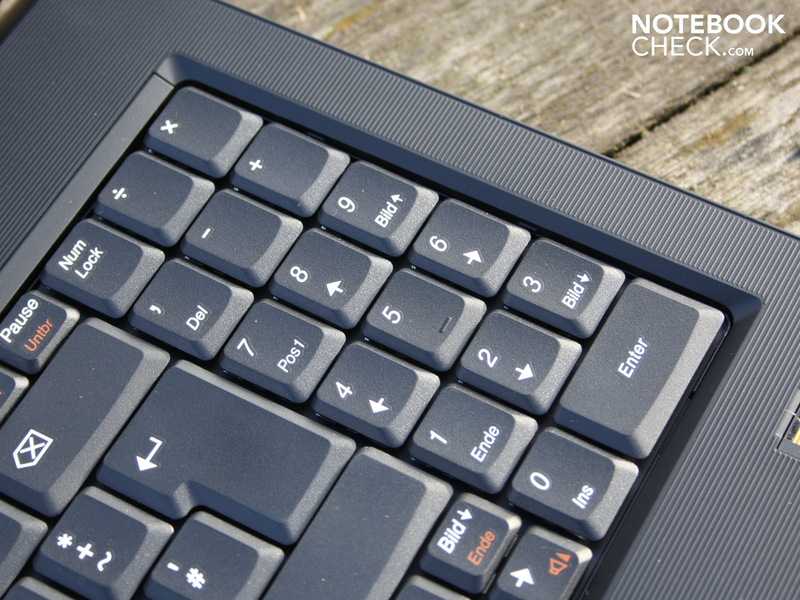 The keyboard supplies a soft, cushioned typing feel. Unfortunately, the keystroke slips into being spongy, in particular when the keys are hit with medium up to high force. 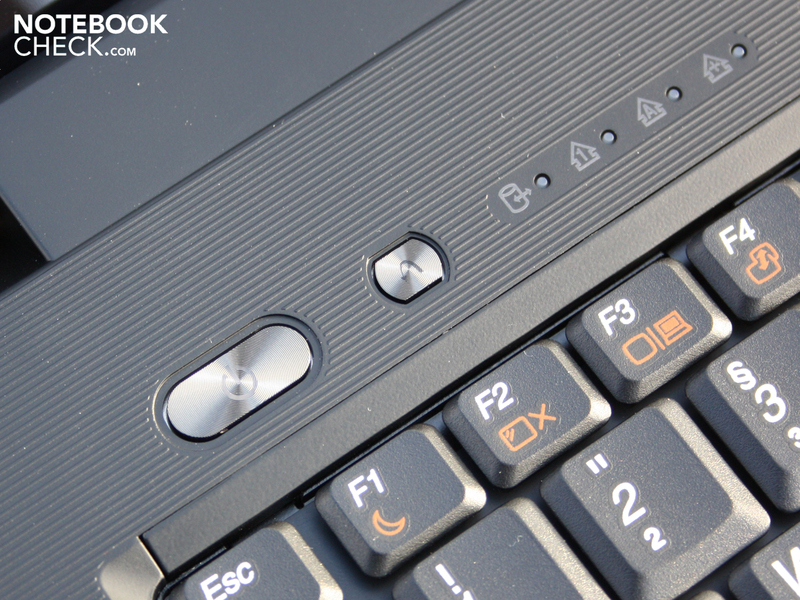 The clear pressure point and long key drop have almost Thinkpad standard, though. The feedback while you're typing is overall good, especially when hitting the keys hard isn't a characteristic of the typist. In this case, coiling is hardly noticed. We quite liked the key's clear, white lettering. They remain well visible particularly in dimmed light. The arrow keys grouped in the lower part and the large enter, shift and backspace key round off the keyboard. The comma is placed adversely in the number pad's upper row. This doesn't comply with the standard layout, as users of desktop keyboards are familiar with. The user will have to live without multi-touch in the Elan Smartpad (v2.4). Two finger gestures, like for scrolling or zooming, are thus not available. Apart from that, the pad can be used quickly. It's enough to place the finger very lightly on the pad. Tiny knobs supply a pleasant glide feedback. Horizontal (unmarked) and vertical (haptically marked) scroll fields are present and can be used accurately. The large surface, with a diameter of 9 cm, is sensitive up to its edges. The mouse keys aren't as good as the rest of the pad because of their low key drop. However, they can be used quickly due to a clear pressure point. A highlight is the plastic key's soft bearing. The outer left and right side can be depressed further than in the center, like a see-saw. The resulting muffled click noise won't make enemies out of the other library visitors. The 15.6 inch B560 has a 16:9 widescreen with 1366x768 pixels. A 4:3 business feeling doesn't turn up with this screen. You quickly lose track when working with two or three detail rich applications, such as MS Project, Excel and Outlook. Only external TFTs connected to HDMI or VGA will help in this case. A very low contrast of 124:1 results with the black value of 1.66 cd/m2 (center). A higher contrast would produce deeper black and clearer contours. High contrasts are neither standard nor mandatory for office devices (in our opinion). 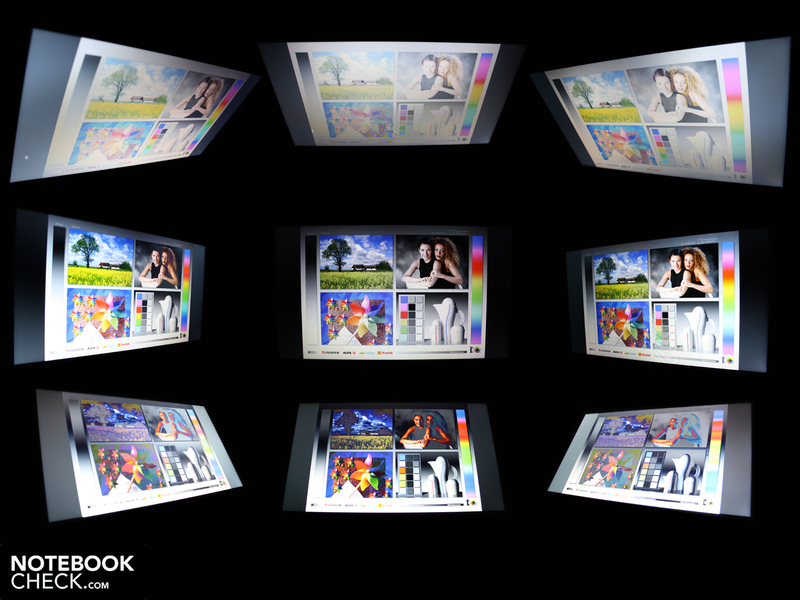 Colors are prettied up optically by the glare type display (LP156WH2-TLAA), but they are generally pallid. The B560's color spectrum isn't suitable for pros in image processing. Neither AdobeRGB nor sRGB come even close to being covered. Thus, the LG Philips screen even scores poorer than the good (but not perfect) Sony Vaio EB3Z1E display (consumer). The screen's brightness only has an average of 195 cd/m2. This is sufficient for the office in any event. But there will be problems in sunlight. The B560 doesn't reduce the brightness in battery mode. The illumination of 89% is even and there isn't any spot development noticeable on a completely white or black background. The 15.6 inch screen lacks an AR coat (glare type). Due to this and with the low maximum brightness, it's almost impossible to use the screen on the go. The reflections unintentionally show the background on the display and the low maximum brightness is cause for a too dark desktop. The LG screen has been setup badly for a workplace laptop because the mentioned reflections can also be induced by unfavorable light incidence in the office, e.g. through a window or by a table lamp. The display's vertical viewing angles of the usual 10 degrees are very narrow. We have more lenience to the left and right horizontally, but only up to about 45 degrees. Beyond that, the screen dims evidently and colors bleach. 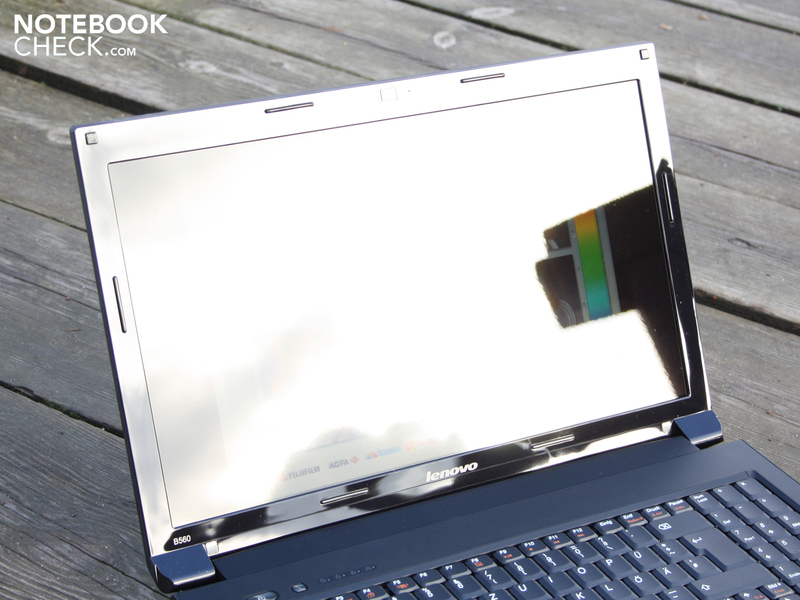 The Lenovo B560's tight viewing angles hardly affect a single user. Only colleagues will experience problems when 5 pairs of eyes try to look on the screen at the same time. This isn't such a problem with text contents, but ghosting can daunt looking at pictures or watching a movie considerably. The Intel Pentium P6100 processor is one of Intel's entry level processors. The dual core processor is based on the Arrandale core, alike the Core i3, i5 and i7 dual core processors. Consequently, the processor has an integrated memory controller and graphics core. In opposition to the Core ix models, the P6100 lacks the Turbo Boost function. Thus, it can't automatically overclock. 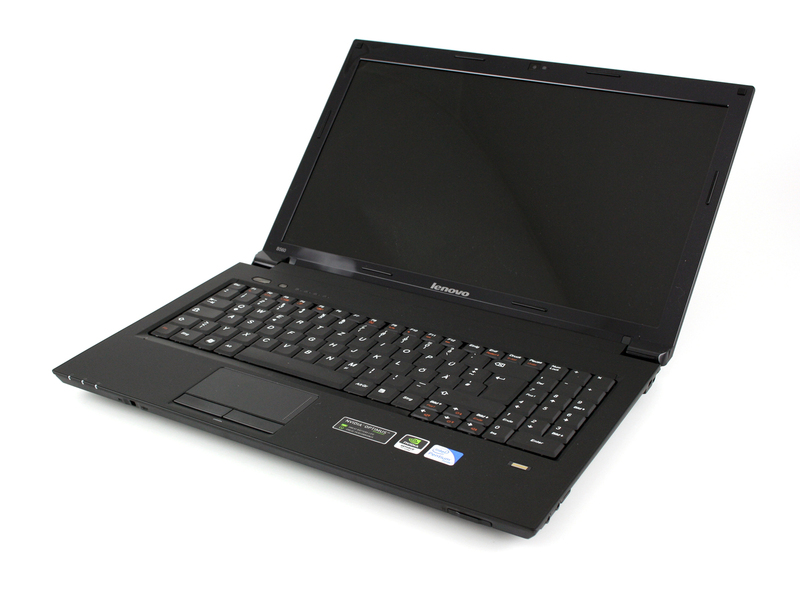 Despite its slow clock rate of 2.0 GHz, the P6100 has a TDP (thermal design power) of 35 watts. As in almost all Arrandale CPUs (even Celeron P4600), the memory controller and IGP graphics card (Intel HD) are incorporated in the processor's bundle. The Nvidia Optimus technology allows an automatic switching between the Intel HD graphics and the dedicated Nvidia 310M GPU. The Intel HD is always enabled during this because its frame buffer is used constantly for video output. 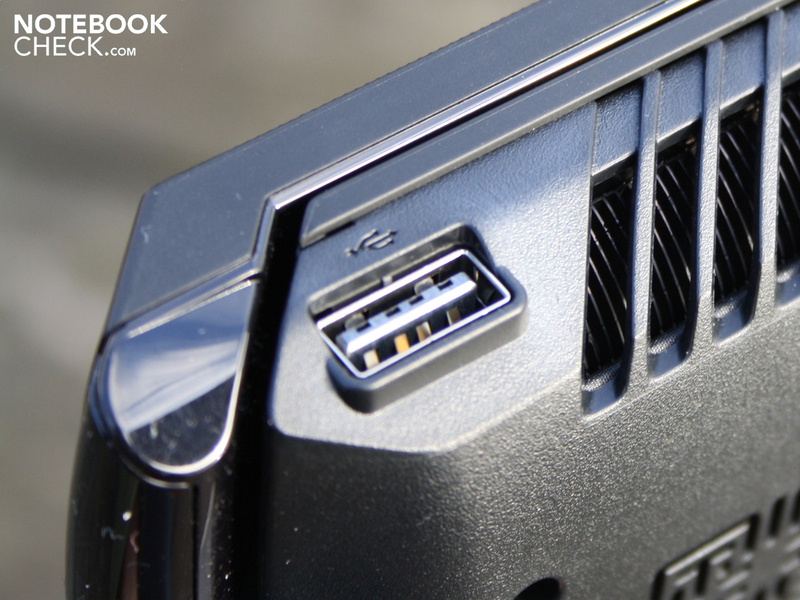 The Geforce 310M writes its video information directly into the IGP graphic's frame buffer. Consequently, there aren't any waiting times or black screens during the automatic switching. The RAM configuration of our test device is theoretically only 2 GB of DDR3 RAM. However, the ordered shop offer only included a single 2 GB bar for self-installation. This resulted in a mixture of a PC3-10700 (667 MHz, Samsung) and a PC3-8500F (533 MHz, Kingston). 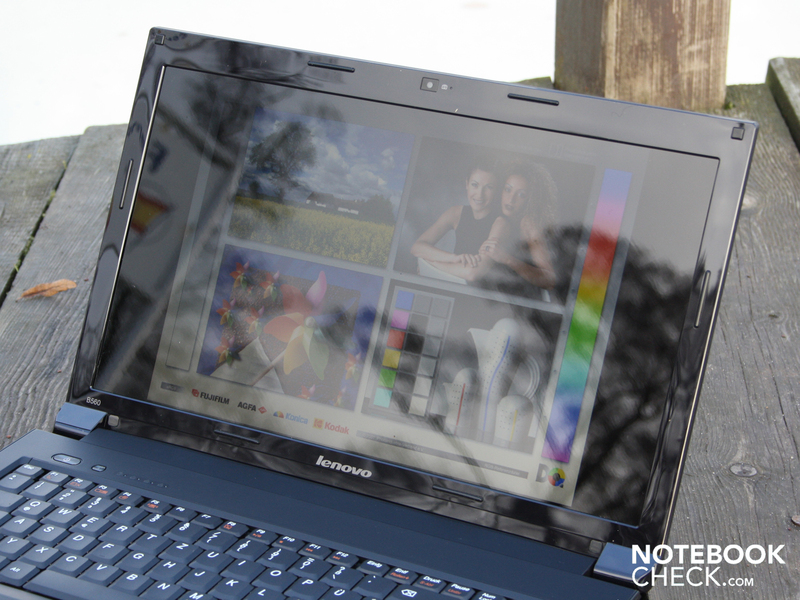 The Lenovo B560 achieves good 4108 points in PCMark Vantage. This is comparatively a large amount for a Pentium P6100 system. 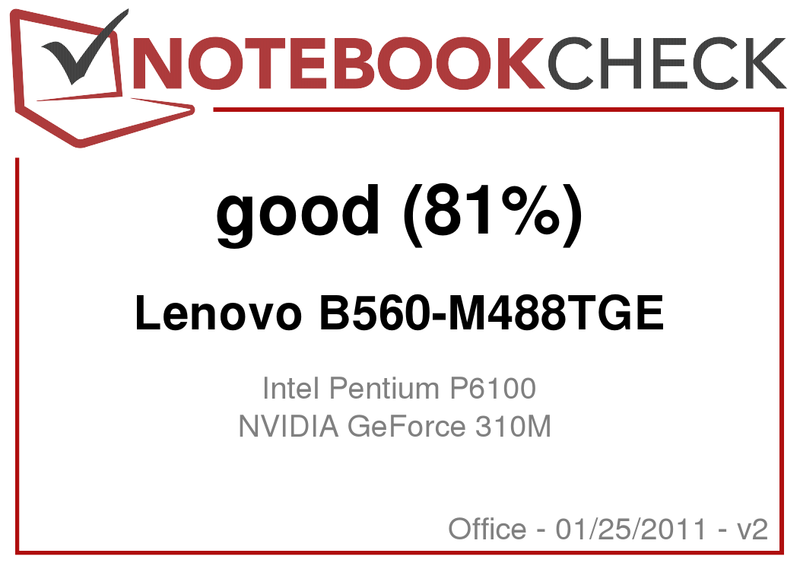 The recently reviewed Toshiba Satellite C660-10E (Pentium P6100, Intel HD only) merely achieved 3409 points. The reason for this advantage is, at least to a part, the Geforce 310M because it supplies a better gaming sub score of 3362 instead of 2158 points. 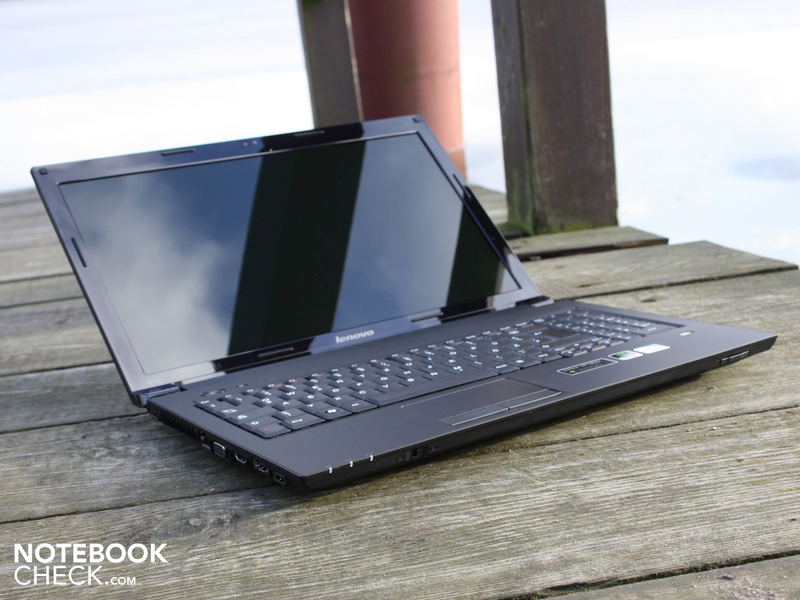 The total performance is equal to a Lenovo IdeaPad Z565 (4093 points) with an AMD N830 triple core and comparably strong Radeon HD 5470 graphics. The B560 user has a clear advantage in relation to budget office devices on the market that are still equipped with the old Pentium generation, T4500 , or AMD Athlon P320. The achieved 3576, respectively 3388 points, achieved in comparison devices are clearly beaten (HP 620, respectively HP 620 with AMD). Core i5 systems that can reach up to 6000 points in PCMark Vantage, depending on the graphics card, are still far out of reach. 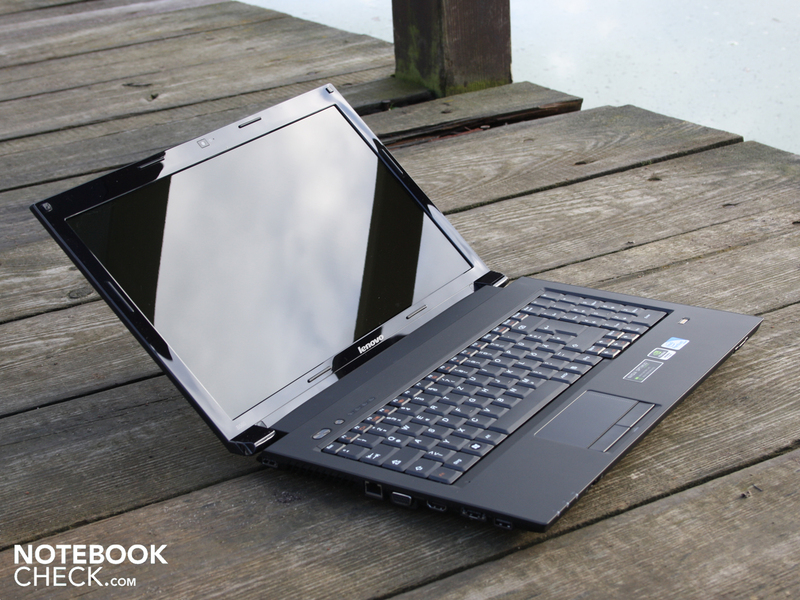 Nevertheless, the B560 doesn't have to fear comparison with i3 laptops that have smaller graphics: An Asus K52JR-SX059V (i3-350M, HD 5470) achieves 4682 points. The benefit of an i3 and i5 CPU is partly the higher clock rate and Hyper Threading. The blend of RAM modules with different clock rates in the test device (533 & 667MHz) neither has an impact on the performance nor does it slow the system down. The reason: The memory controller in the Pentium P6100 only supports a memory rate of up to 1066 MHz. This is in compliance with the 533 MHz bar. The 667 MHz bar (1333 MHz) thus can't run at its maximum rate. The Nvidia GeForce 310M (512 MB DDR3) clocks with a standard rate of 790 MHz in the memory, the core with 606 MHz. The GPU's main task is to support the processor in HD decoding (H.264, MPEG-2, MPEG-4, etc.) and video coding (CUDA, OpenCL). It is questionable if users will execute the latter especially on an entry level system. The 310M's CUDA support can only be used with specially customized programs, such as Badaboom. OpenCL programmers will certainly hardly ever work on a B560 in order to benefit from the according arithmetic unit. Beyond that, the GPU is capable of DirectX 10.1 but not PhysX. Hope of strong gaming performance has to be muted with 3114 3DMarks 2006 (1823 CPU score). The score is however 65 percent better than that of a sole Intel HD (about 1100) in any event. Nevertheless, the outdated 310M is still remote from the performance of a Radeon HD 5650 (about 5800 to 7000 points depending on the CPU). Newer games with moderate requirements are playable in medium details and resolutions. This has already been proven in many tests of this GPU. See the Geforce 310M's spec sheet for more information. We could even play the undemanding game, Fifa 11, in the highest details and maximum resolution (1366x768) in the tests. However, low details and resolutions have to be set for game highlights, such as CoD Modern Warfare 2 or Risen. 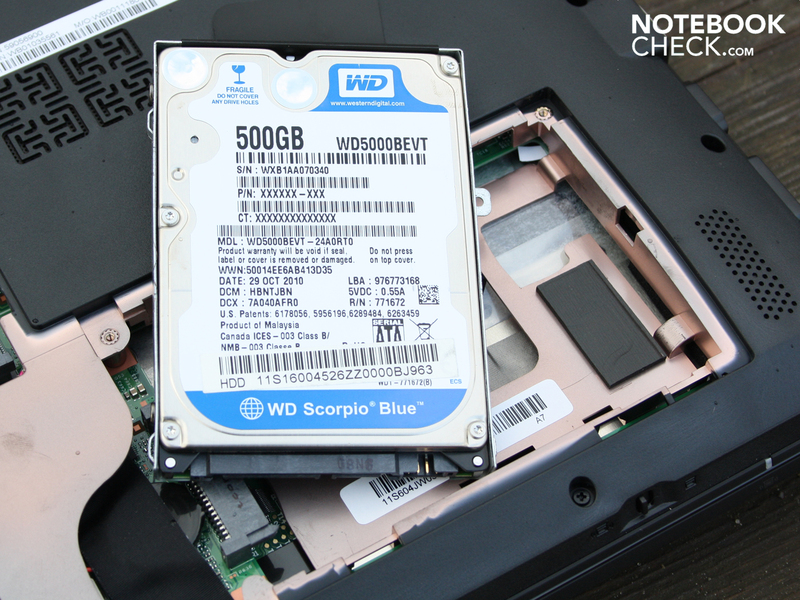 The installed Western Digital HDD (model: WD5000BEVT) puts 500 GB on your desk. The 2.5 inch hard disk is only averagely fast with 5400 revolutions per minute. This is confirmed by the access rate of slow 18.5 milliseconds (HDTune). The transfer rate of 62 MB/s (HDTune, sequential read) is on an average level. The B560 stays pleasantly quiet in idle. The fan shuts down temporarily. It shows itself as unobtrusive with a constant 31.2 dB(A) and only the quiet whirring of the rotating hard disk is audible. The fan starts to increase its speed under load (stress test: CPU + GPU). The 15.6 incher doesn't get annoyingly loud with 37 dB(A) though. This rate can also still be called tolerable in quiet surroundings. The temperature doesn't exceed 28 degrees on the work surface during operation with mostly idle and short load conditions. The average is only 26 degrees. The bottom remains cool with a maximum temperature of 31 degrees. The temperatures only increase selectively by 3 to 5 degrees under constant load. Thus, they are unproblematic. The wrist-rest's and touchpad's throughout low temperature is agreeable. The stress test wasn't able to bring the Pentium P6100 beyond 66 degrees Celsius (sensor). The GPU temperature couldn't be read out. The speakers, located underneath the wrist-rest on the front, supply a midrange-heavy sound. They don't add any basses to our music. Thus, the trebles, basses and midranges aren't balanced. The volume is quite good and sufficient for filling a small room with sound. However, the small membranes start to drone in maximum volume. External speakers linked to the 3.5 millimeter jack should be used for a balanced sound experience. We test this with two Yamaha speakers (YST-M20SDP). The level tethered to the notebook is fairly high and can sometimes overburden the connected loudspeakers when turned up to full. We determine 2:52 hours (172 minutes) during WLAN surfing. This is a quite good runtime in view of the low battery capacity of 4400 mAh (48 Wh). Apparently, Nvidia Optimus helps save energy by disabling the Geforce 310M. 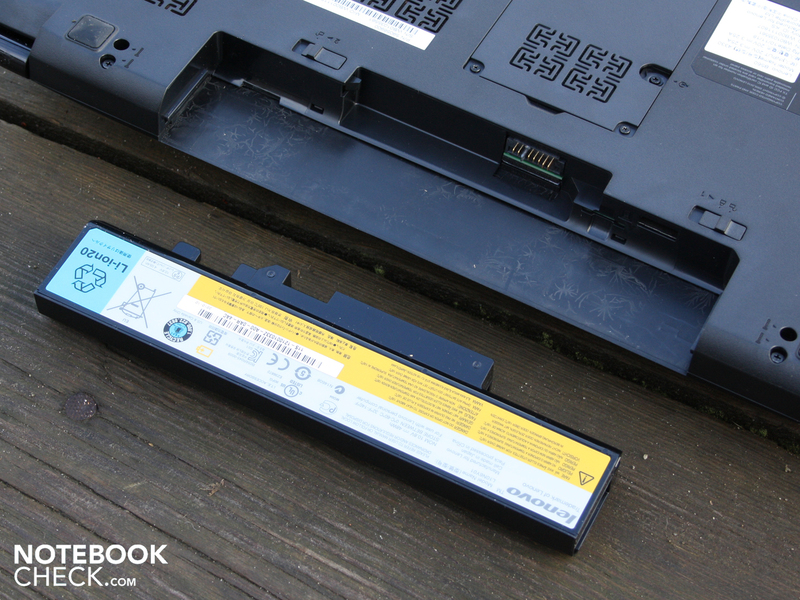 Office opponents, such as HP's 625 WS835EA (inexpensive) or HP's ProBook 6555b (expensive) achieve about the same battery life. The DVD test equals the WLAN test. The movie comes to an end after 2:56 hours (176 minutes). We played the DVD in medium brightness of 100 cd/m2. 2:03 hours pass until we can continue watching. This is how long the battery needs for recharging after a 100% discharge. The B560's maximum battery life is 5:00 hours (300 minutes). However, such a long runtime is unrealistic in practical use. The processor and GPU were almost completely idle, the WLAN module was disabled and the brightness shone in its lowest setting. 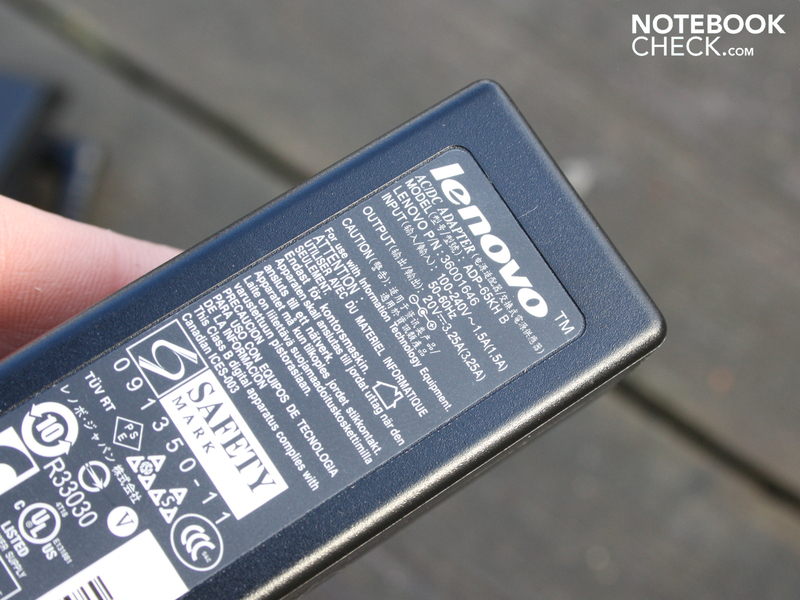 The good battery life indicates low power consumption despite the weak battery. The multimeter confirms the assumption with 11 watts in idle. However, the energy saving options has to be enabled for this (minimum brightness, wireless off). Optimus turns off the Nvidia 310M in this state. Depending on the selected energy mode (high performance, wireless on, maximum brightness), the idle requirement can also be as high as 15 watts. The power consumption during the stress test (CPU load via Prime95) climbs to 39.7 watts. The power consumption increases to 46.5 watts when the Geforce 310M is enabled. Thus, the handy 65 watt adapter is aptly sized. 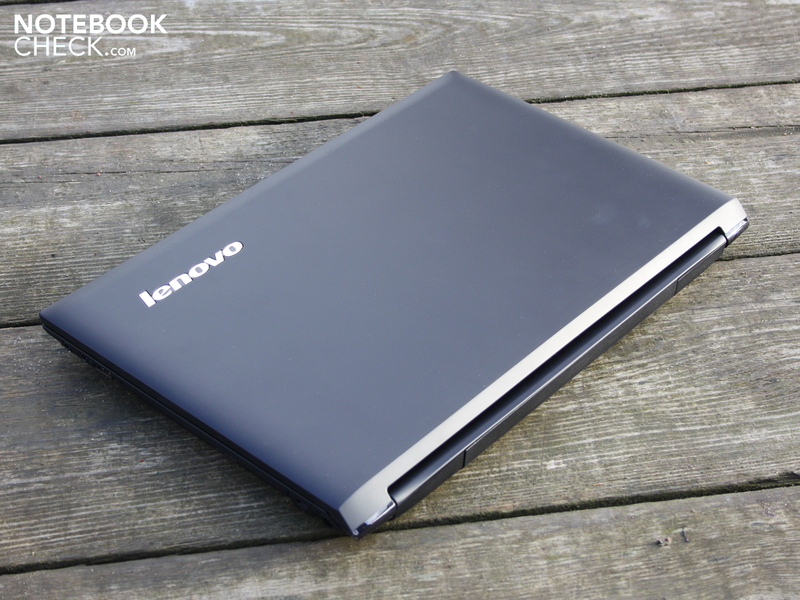 The Lenovo B560 (M488TGE) bids up to date hardware and office qualities with only minor drawbacks for little money. We have reviewed the FreeDOS alternative for 399 euros (4GB RAM). Nvidia Optimus not only helps save energy by disabling the Geforce 310M, but also with the good battery life of almost three hours (WLAN test). The configuration with eSATA, a 500 GB hard disk and WLAN draft n/Gigabit LAN is impressive in the 400 euro price range. Moreover, there are the typing-eager input devices. Due to the coiling key surface and the low key drop (touchpad only), it's not a perfect condition. However, the 15.6 inch glossy display is a big downside for an office device. Reflections on an office laptop weren't ever and aren't contemporary. If you have to heed your money, you will get a technically well equipped laptop (Arrandale Pentium, Optimus) for 400 euros and you can opt for either a free (Linux, etc.) or commercial (Microsoft) operating system. We could set up the system quickly and perfectly after installing Windows 7 Home Premium 64 bit due to the driver CD. 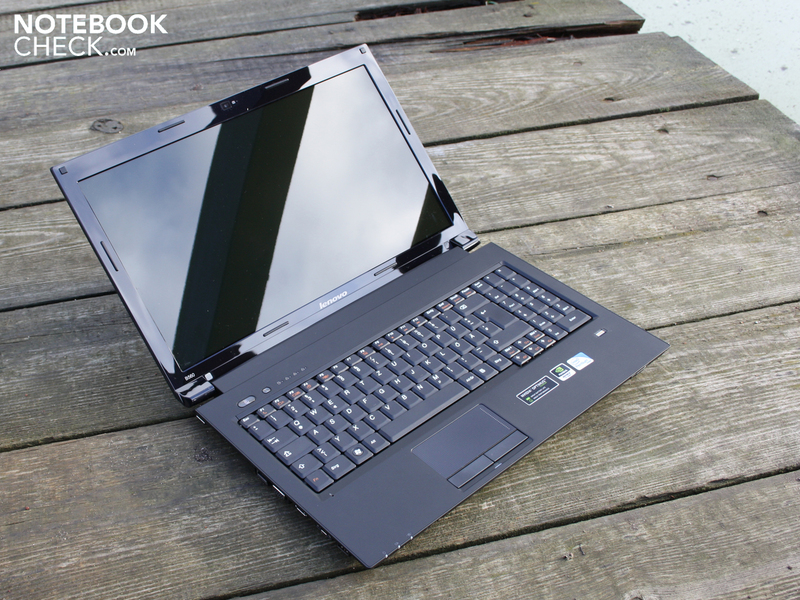 Additionally, the high PCMark Vantage score proves the performance gain of an individually setup laptop afterwards. Lenovo IBM B560 (M488TGE): A viable office device with a small dedicated graphics card and Nvidia Optimus is available for starting at 399 euros. 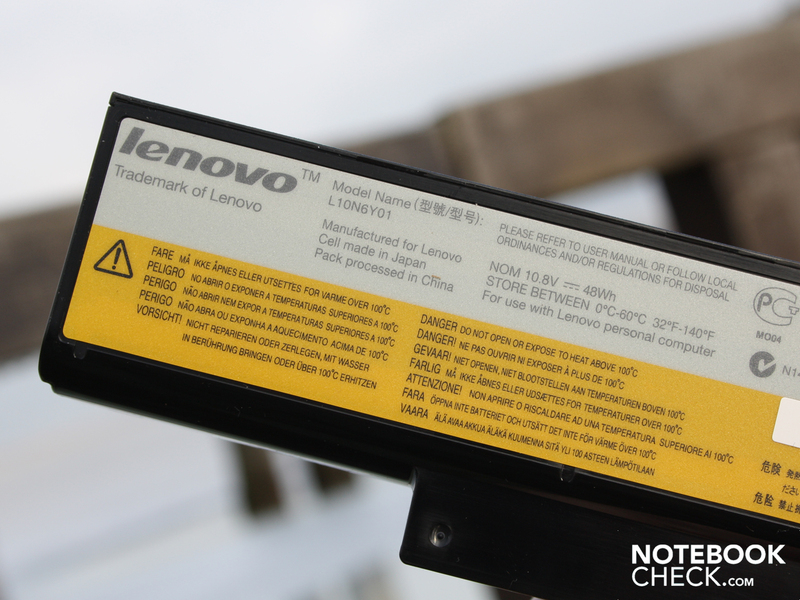 Lenovo Essential B series: Are the 15.6 inchers a warranty for the best possible performance for value ratio? The adapter has an unusually elongated shape. It only weighs 217 grams and is well portable. 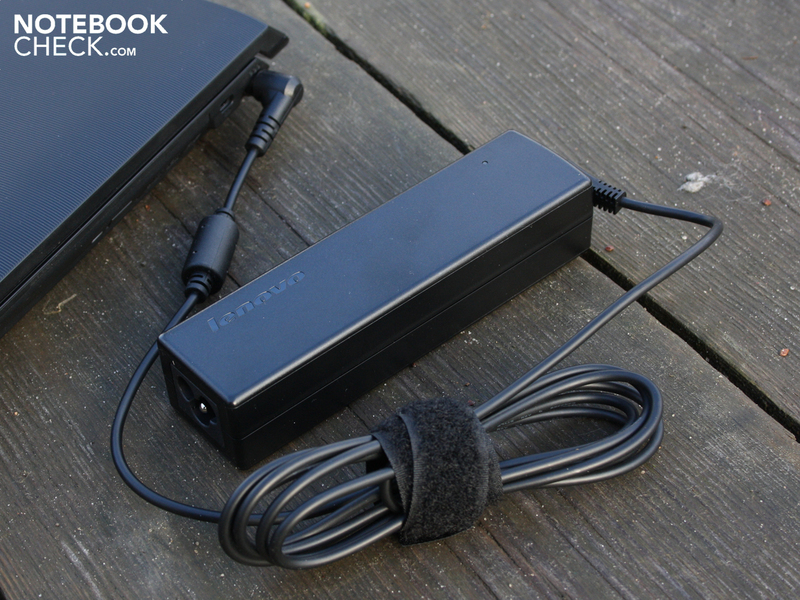 The adapter supplies 60 watts (maximum consumption: 45 watts without load). 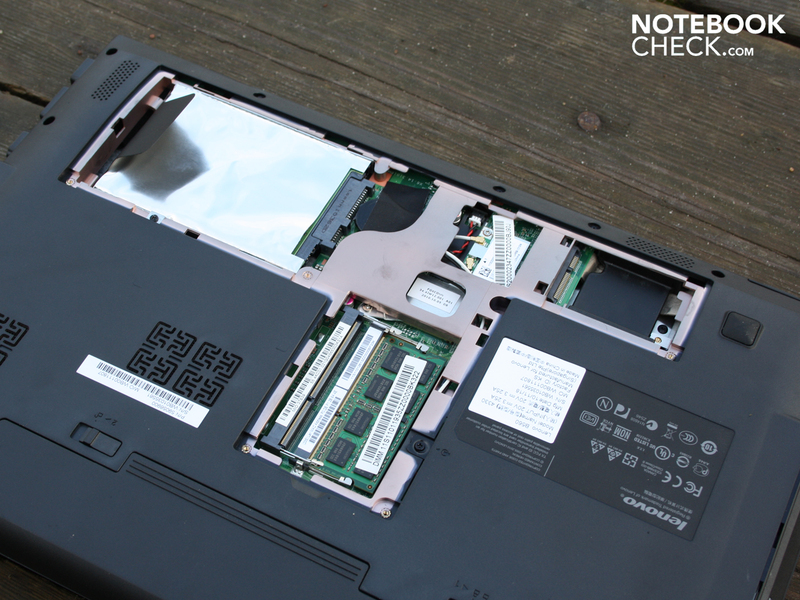 The Lenovo B560's innards don't seem to be particularly interesting. 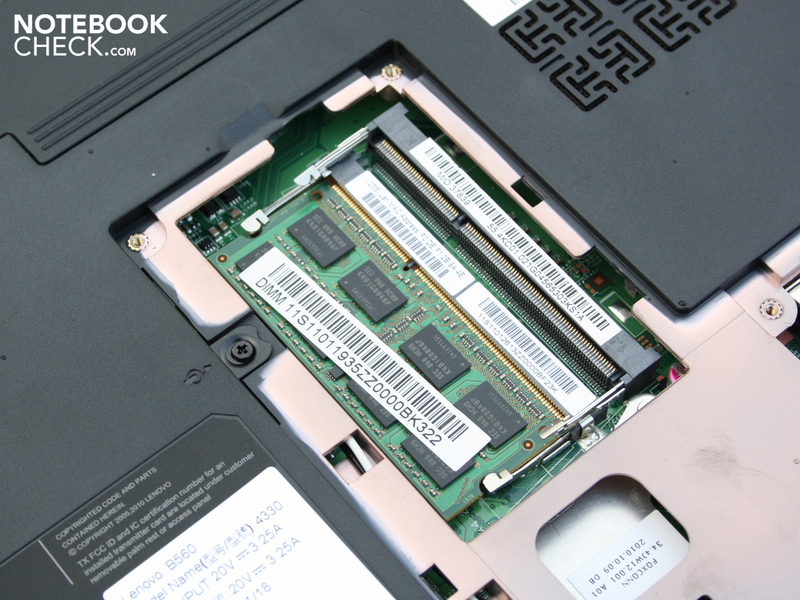 A 2GB DDR3 bar from Samsung was inserted in the test system. A second 2GB Kingston bar was included in the package for self-installation. 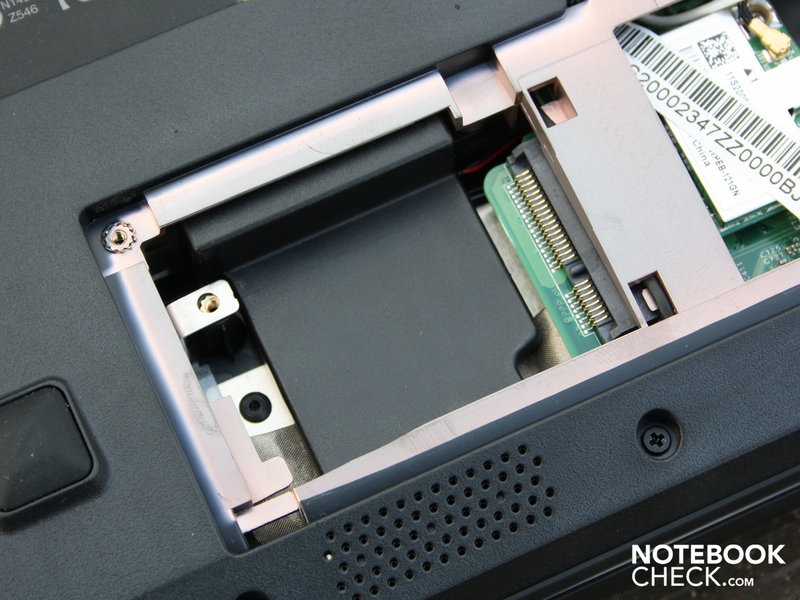 Update option: A second mini PCI express slot is ready for a module. Supplies in the 400 euro price range: a manual, warranty declaration and a driver CD. 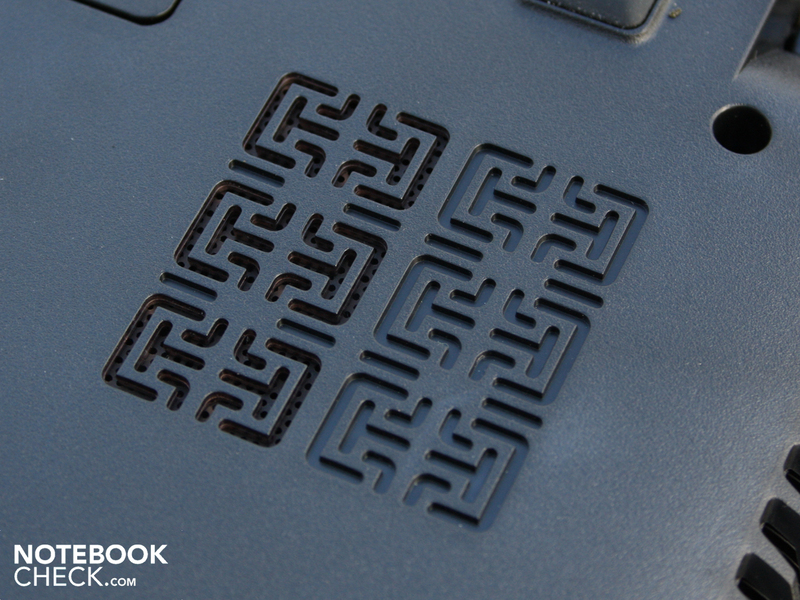 Lenovo IBM B560 (M488TGE): matt surfaces with haptically ribbed texture. 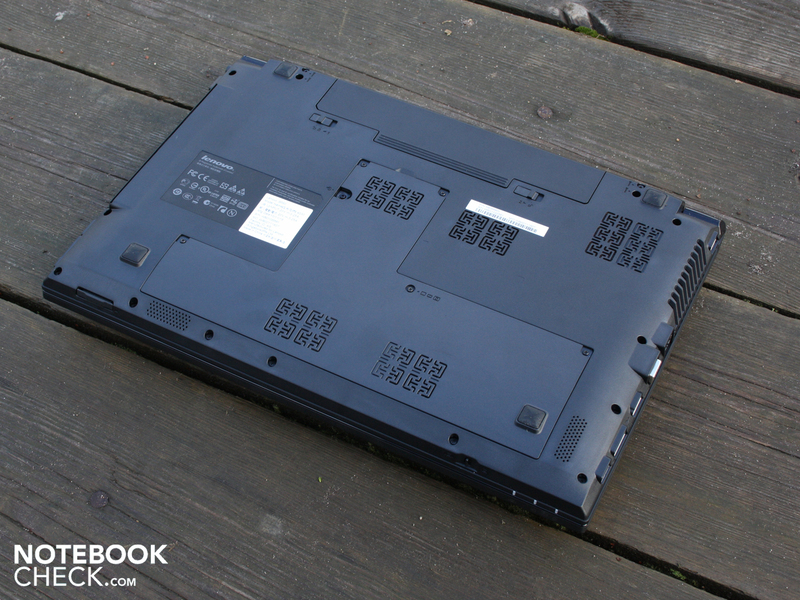 Lenovo IBM B560 (M488TGE): the details on the case are subtle and unobtrusive. That keeps the 15.6 incher up and going for almost three hours (WLAN test). The lithium ion battery only has a capacity of 48 watt hours. The buyer has to invest reasonable 399 euros for our test device B560 (M488TGE). This doesn't include an operating system, but a dedicated Nvidia graphics controlled by Nvidia Optimus is installed. The reflective TFT is the only glossy component. The bulky case with a weight of 2.5 kg is completely uncoated. and stops on the haptically excellent touchpad. The interfaces have been put on a diet. However the eSATA on the left is a small highlight. 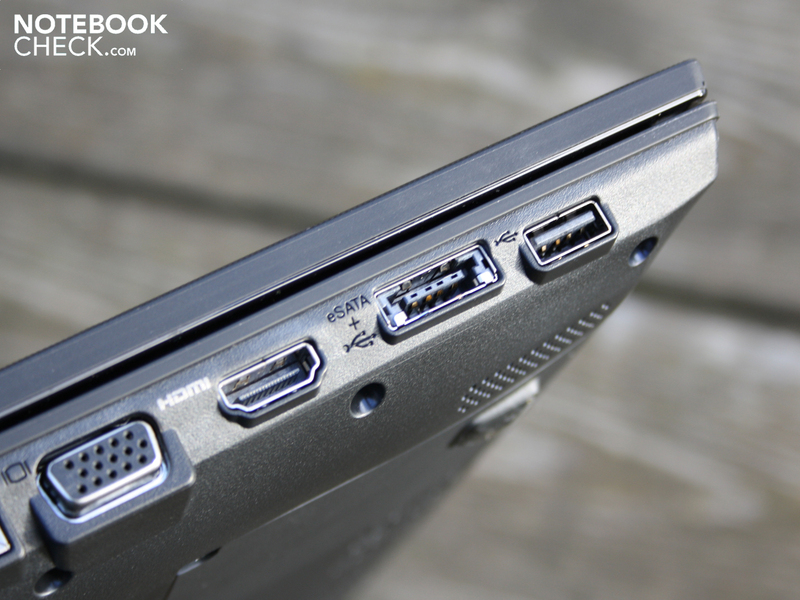 USB, VGA, HDMI and Ethernet, there aren't any other ports. 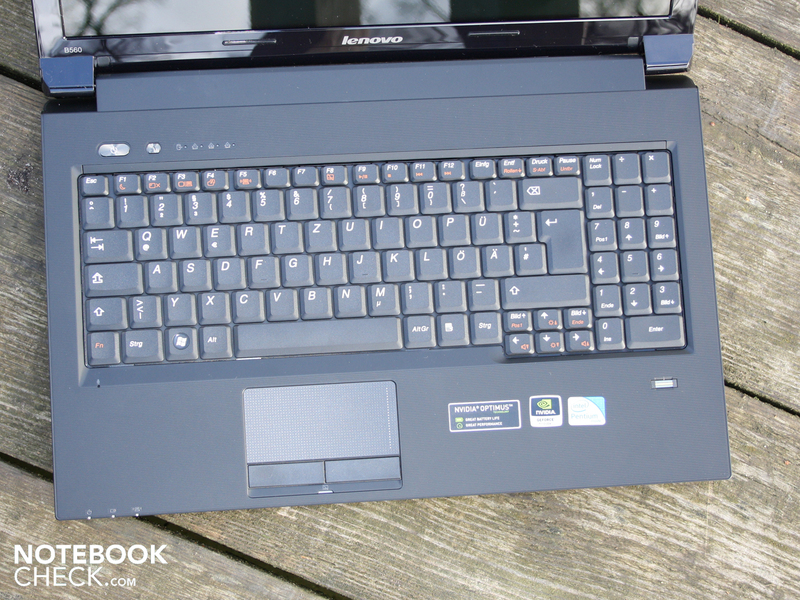 Lenovo IBM B560 (M488TGE): the keys have a clear key drop and a crisp pressure point. Unfortunately, the key surface coils slightly on the left. The ribbed texture on the surfaces is pleasant to handle. The partly soft stroke can be overlooked due to the keys' good feedback. An AR coated screen would have made a buying decision a lot easier for many. Optimus with a small graphics card at a competitive price.